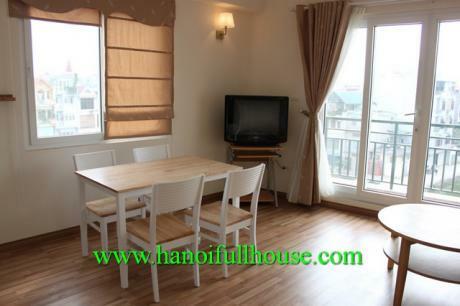 This bright serviced apartment for rent with beautiful natural light, balcony and airy. 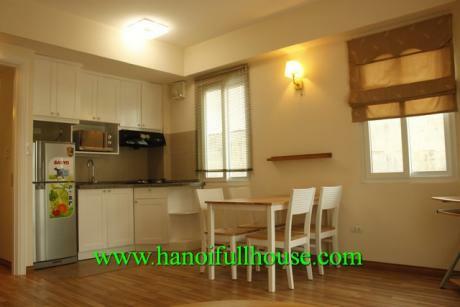 This apartment has usable area is around 50 sqm, well designed with one private bedroom and a living room. It is wooden floor, furnished and quiet location of Ngoc Ha village where is close to Bach Thao park, B52 lake, bus station. This apartment has a modern bathroom, a nice kitchen, good airconditioners with 2 ways, a washing machine, a nice sofa, fast internet. This apartment is suitable for teachers.